Rabbi habli milladunka zurriyatan tayyibatan innaka sameeud dua. 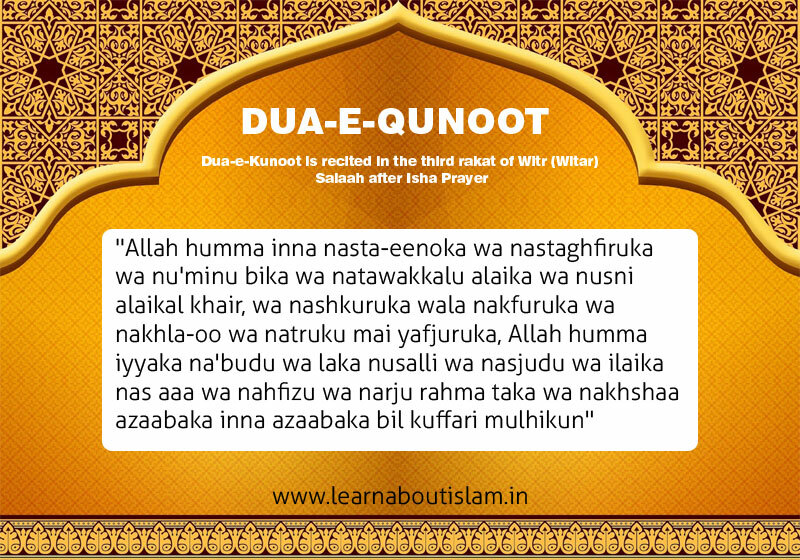 Dua-e-Qunoot is recited in the third rakat of Witr (Witar) Salaah in Isha Prayer. Hazrat Ayesha Radi Allahu Anhu reported in Abu Dawood and Tirmidhi hadith that the Holy Prophet sallallahu alaihi wasallam used to offer 3 Cycles in the Witr Prayer. The Witr Prayer is Essential (Wajib) in the Night (Isha) Prayer. Allahuma innaa nastaeenuka wa nastaghfiruka wa numinu bika wa natawakkalu alayka wa nusnee alaykal-khayra, wa nashkuruka wa laa nakfuruka wa nakhlaoo wa natruku maiy- yafjuruk, Allaahumma iyyaka nabudu wa laka nusallee wa nasjudu wa ilayka nasaa wa nahfidu wa narjoo rahmataka wa nakhshaa azaabaka inna azaabaka bilkuffari mulhiq. "O Allah !! We seek Your help and seek Your forgiveness - and we believe in You and rely on You - and we praise You with all goodness - and we are thankful to You and not ungrateful to You - and we separate from and forsake whoever offends You. O Allah !! You alone we worship and for You only we offer the Prayer and the prostration. And towards You only do we rush, and present ourselves for service. And we hope for Your mercy and fear Your punishment. Indeed Your punishment will grasp the disbelievers." Allahuma Rab-banaa Aatinaa Fid-dunyaa Hasanatan Wa Fil Aakhirati Hasanatan Wa Qinaa'Azaaban Naar. "O our Rabb !! We seek of You good in this world and good in the Hereafter and safety from the torment of Hell." Or they should recite “Allahummaghfirlana” thrice. In English: Make intention of Sunnat-e-Maukida for the sake of Allah, faciing towards Kaaba, Behind the Imam and say "Allahu Akbar "
Allahumma Ajirnee Minan Naar, Ya Mujeero, Ya Mujeero, Ya Mujeer. 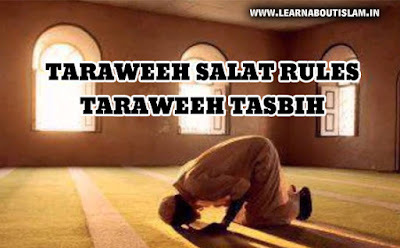 Tarawih salaah is SUNNAT MU-AKKADAH for both men and women. To perform Tarawih with jama'ah is sunnat-kifayah for men. If a person performs Tarawih at home whilst Tarawih is being performed at the Masjid, he will not be sinful. However, if all the neighbours perform their Tarawih alone at home, then all will be sinful because of neglecting the jama'ah. The time for Tarawih is from after Isha salaah to a little before Subhus-Sadiq. It can be performed either before or after the Witr salaah. If one has missed a few rak'ah of Tarawih and the Imam has commenced the Witr, then this Muqtadi may join for the Witr and complete the remainder of his Tarawih thereafter. 20 raka'at with 10 Salaam are masnun, one should have a niyyah for 2 raka'at of Tarawih each time. 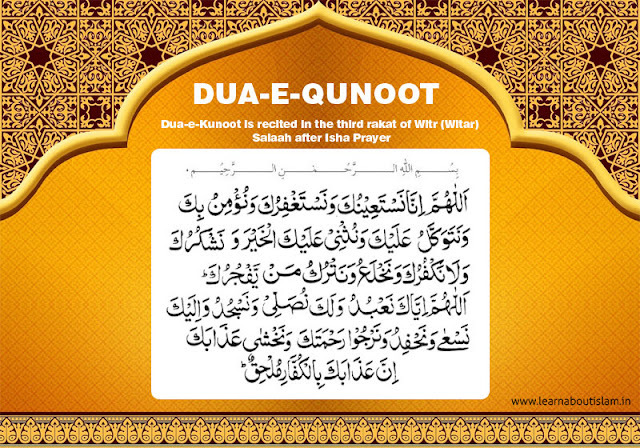 After every 4 raka'at it is Mustahab to sit a while and read the above dua. One may remain silent or recite the Qur'an or tasbih in a low voice or say Nafl salaah separately during the period of rest after every 4 raka'at. It is makruh to perform Tarawih sitting if one has the strength of qiyam (standing). While performing Tarawih some people do not join the Jama'ah from the beginning but join the Imam when he prepares to go into Ruku'. This is makruh. They should join at the beginning. If one does not get the Jamaa'ah for Fardh of Eisha, he should perform his Fardh alone and then join the Jamaa'ah for Tarawih. Rabbana atinafee addunya hasanatan wafee al-akhiratihasanatan waqina AAathaba annar. La ilaha il-lallah Al-`Alimul-Halim. La-ilaha illallah Rabul- Arsh-al-Azim, La ilaha-il-lallah Rabus-Samawati Rab-ul-Ard; wa Rab-ul-Arsh Al- Karim. None has the right to be worshipped but Allah the incomparably great, the compassionate. None has the right to be worshipped but Allah the rub of the mighty throne. None has the right to be worshipped but Allah the rub of the heavens, the rub of the earth, and the rubb of the honorable throne. Our Lord! Forgive us our sins and remit from us our evil deeds, and make us die in the state of righteousness along with Al-Abrar (those who are obedient to Allah and follow strictly His Orders). e) Dua for Protection against Debt, Oppression, Sadness. Inna salati wa nusuki wa mahyaya wa mamati lillahi rabbil-alamin, la sharika lahu, wa bidhalika umirtu wa ana min al-muslimin. Allahummahdini liahsanil-amali wa ahsanil-akhlaqi la yahdi li ahsaniha illa anta wa qini sayy’al-a’mali wa sayy’al-ahaqi la yaqi sayy’aha illa ant. Indeed my salah (prayer), my sacrifice, my living, and my dying are for Allah, the Lord of all that exists. He has no partner. And of this I have been commanded, and I am one of the Muslims. O Allah, guide me to the best of deeds and the best of manners, for none can guide to the best of them but You. And protect me from bad deeds and bad manners, for none can protect against them but You. O Allah! 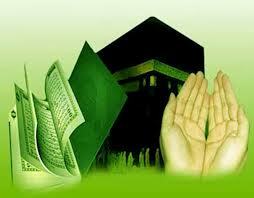 I ask you for your guidance, piety, safety and wellbeing and contentment and sufficieny. Our Lord! Avert from us the torment of Hell. Verily! Its torment is ever an inseparable, permanent punishment. Evil indeed it (Hell) is as an abode and as a place to dwell. 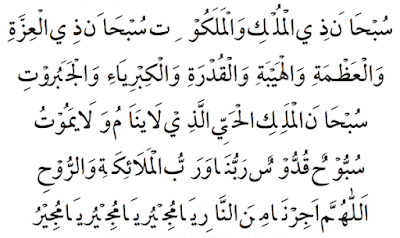 j) Dua for confessing your Sins – Dua of Yunus aleyhi salaam. If you know what verse follows this verse you will never stop making this dua! SubhanAllah. May Allah answer our prayers as He responded to the call of our beloved Prophet Yunus aleyhi salaam. [none has the right to be worshipped but You (O Allah)], Glorified (and Exalted) are You [above all that (evil) they associate with You]. Truly, I have been of the wrong-doers. Indeed, I am overpowered, so help(me). Sufficient for us is Allah , and [He is] the best Disposer of affairs. m) Dua for Job Security + Marriage – Musa aleyhi salaam. One of my favourite Duaas. This dua ensured Musa aleyhi salaam got a job security for 8-10 years and got him married. My Lord, indeed I am, for whatever good You would send down to me, in need. Ya Hayyu Ya Qayyum! Bi rahmatika astagheeth! Allahumma inni a’udhu bika min ‘adhabi jahannam, wa min ‘adhabil-qabr, wa min fitnatil-mahya wal-mamat, wa min sharri fitnatil-masihid-dajjal. 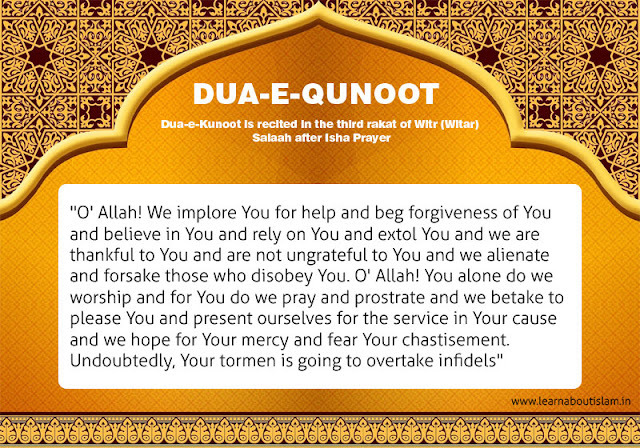 q) Dua for acceptance of dua! RabbiawziAAnee an ashkura niAAmataka allatee anAAamta AAalayya waAAalawalidayya waan aAAmala salihan tardahuwaaslih lee fee thurriyyatee innee tubtuilayka wa-innee mina almuslimeen. (There is no god but Allah). "Subhanal lahi wa bi ham-di-hi ada-da Khal-qihi wa rida'a naf-sihi wa zina-ta 'ar-shi-hi wa mida-da Kale-mate-hi." ...a date tree is planted for him in Paradise." (O Ever Living, O Self-Subsisting and Supporter of all, by Your mercy I seek assistance, rectify for me all of my affairs and do not leave me to myself, even for the blink of an eye). Aishah (R) says that the Prophet (S) loved the short but comprehensive, meaningful supplications more than others. 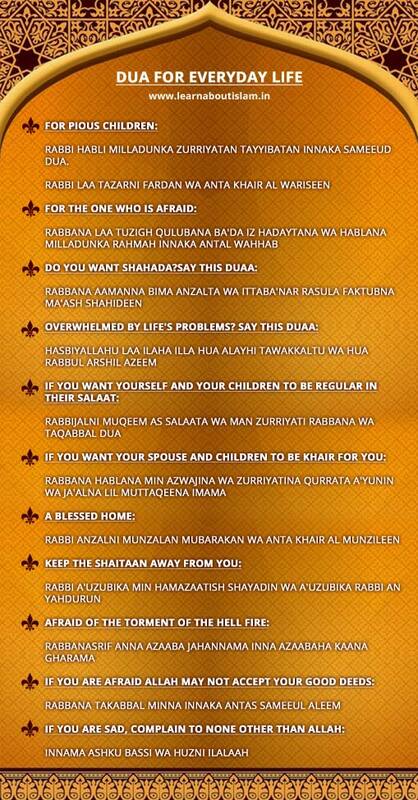 Following are some of these supplications, which are a must for every believer. "When one of you eats, he should mention the name of Allah before beginning. ...he will be forgiven for his past sins. 1) It is from the sunnah to repeat your dua 3 times. 2) It is from the etiquette of dua to make it in a moderate voice. O people! Don’t exert yourselves, for you do not call a deaf or an absent one, but you call the All- Listener, the All-Seer. Al Wali – The Protecting Friend. Al Qareeb – The One who is Near. Al Wakeel – The Most Trustworthy. 4) If Allah granted the dua of Shaytan do you think he will not grant your dua? b) Yes but on a later date, not immediately. c) Some difficult/trouble is waved off. 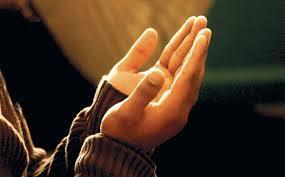 5) Make dua for your friends and Ummah, Angels will make the same dua for you. It is an absolute win win situation. Make sure you make dua for atleast 10 close friends. 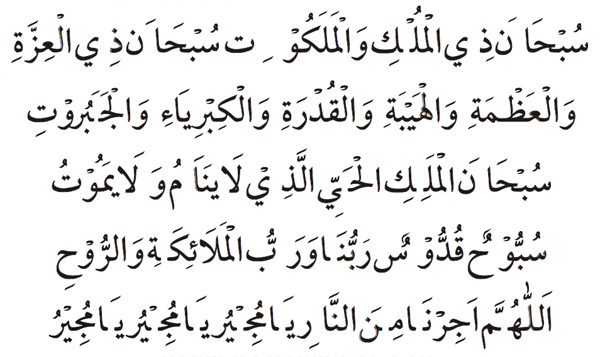 6) Begin & End your dua by sending Salaam on Prophet Muhammad. 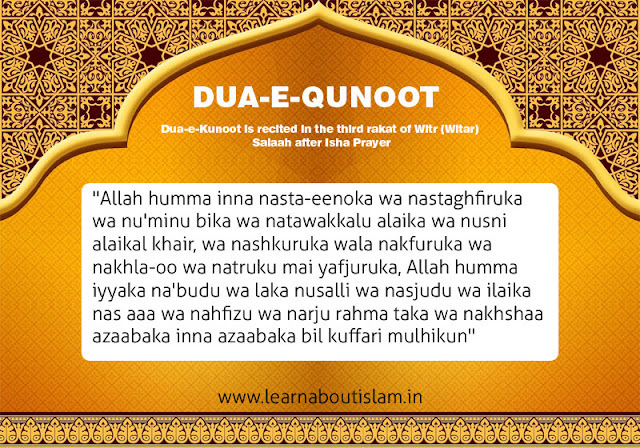 7) Dua is a form of Worship. You get rewarded for making dua. This itself should be reason enough for us to be constantly engaged in making dua.